These are CUSTOM PRODUCTION PARTS. Using a Special Corrosive Resistant Steel material that is also more elastic. History: Since the release of the Magellan Explorist 510 610 and 710 units. We have encountered many customers requiring repair for Corroded Battery Contacts. The problem is that the battery acid corrodes the contacts. The problem is compounded by the fact that even if you could wash off most of the battery acid and the fragile 0.2mm Spring Leaf Contact losses most of its elasticity. 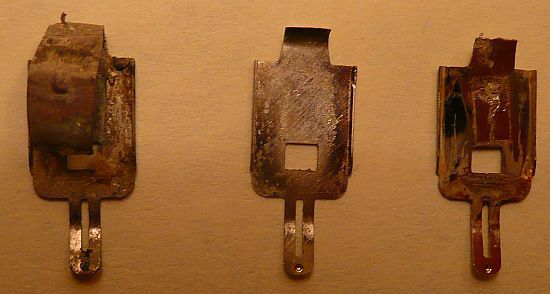 In many case, the severity of the acid corrosion is that it breaks the connection to the motherboard. Sometimes just the continued use of the Spring will led to its complete fracture. Notice the two examples of broken contacts on the side right of the photo insert. Customers inquire if we do this repair. The bad news is that we could only replace the complete back panel. Our NEW SERVICE now allows us to offer a method to either have us repair the unit OR YOU CAN NOW REPAIR THE PROBLEM YOURSELF WITH OUR NEW "DYI" REPAIR KIT. After repairing thousands of these puppies, we decided to offer the service on this web page. It is an economical way for the user to either have us repair the component or for the user to do the project themselves. Our plan greatly overcomes the exorbitant price of postage abroad and offers excellent service. Additionally our customers do not have to be concerned with GPS serial number mismatches or the use of their present maps or other data on their unit. WE DO NOT ACCEPT THE COMPLETE GPS UNIT AS THIS WOULD HORRENDOUSLY RAISE THE DOMESTIC AND INTERNATIONAL POSTAGE.